Karimi was voted Asian Footballer of the Year in 2004. This past weekend, the championship of Iran’s Persian Gulf Pro League was to be decided in a pair of soccer matches. Teraktor-Sazi, No. 1 in the standings via goal-differential tiebreaker, would be facing second-place Naft Tehran. All Teraktor-Sazi had to do was win on its home field to end a 52-year title drought. If Naft Tehran won, they would be the champs. And then there was third-place Sepahan, whose only chance at a championship was to beat middle-of-the-pack Saipa and hope for a draw between the top two clubs. Although Teraktor-Sazi jumped out to a 3-1 lead in the second half, Naft Tehran was able to tie the match 3-3 in the closing minutes. Apparently thinking they’d still clinch a title with a draw, Teraktor-Sazi played keep-away offense and prevent defense, running down the clock to preserve the draw instead of going for the win. The crowd of reportedly 90,000 Teraktor-Sazi fans (packing a stadium built to hold 70,000 people) celebrated at the final whistle, as did the players and manager Toni Oliveira. Meanwhile, on another Iranian soccer field, Sepahan was putting the finishing touches on a 2-0 victory over Saipa. Sepahan, not Teraktor-Sazi, would be the Persian Gulf Pro League champions. Then things got weird. Naft Tehran officials had been following the Sepahan vs. Saipa match on a locker-room television, and later reported that with three minutes remaining in that match, all cable, radio and cell phone feeds blacked out. Naft Tehran officials claimed they were told Sepahan and Saipa had played to a 2-2 draw. When Teraktor-Sazi officials were notified of the miscalculation, they chose to lie to the fans — announcing over the stadium PA system that their club had indeed clinched the championship. The idea was apparently that if the fans didn’t find out the truth until later, once they’d left the stadium, then they wouldn’t riot inside the stadium. (Of course, in the United States, the fans would’ve rioted either way, win or lose.) But despite the attempted media blackout, word eventually got out that Teraktor-Sazi had actually lost the title, and the fans predictably became unruly. What was supposed to be a marquee weekend for the Persian Gulf Pro League ended up making headlines around the world for the wrong reasons. In the moment when it could showcase its best, elite soccer in Iran wound up looking very amateurish. That was never the case during the career of Ali Karimi. From his pro debut in 1996 to his retirement in 2014, Karimi scored 101 goals in league play — taking his talents to Iran, Qatar, United Arab Emirates and Germany — and netted 38 goals for the Iranian national squad. The 5-foot-10 midfielder and forward was part of three league championship teams (two in the Persian Gulf Pro League with Perspolis, one in Germany’s Bundesliga with Bayern Munich) and led Iran to an Asian Games title in 1998. 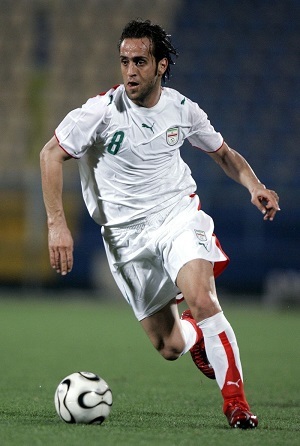 Karimi was voted Asian Footballer of the Year in 2004, and in 2006 helped Iran qualify for the World Cup. He actually finished his career playing for Teraktor-Sazi, helping them win Iran’s coveted Hazfi Cup tournament in his final season. Karimi was such a key figure for Iran’s national team that when the country’s soccer federation wanted him off the team in 2008 for publicly criticizing them, Iranian President Mahmoud Ahmadinejad and Hassan Khomeini (grandson of Ayatollah Ruhollah Khomeini) personally stepped in to keep Karimi on the squad. Karimi played three seasons in Germany, but spent most of his career close to home in Asia and the Middle East. He reportedly turned down lucrative offers from Spain’s Atletico Madrid and Austria’s Red Bull Salzburg. While that is often a surefire way for any athlete to become a hero in his region, one incident during Karimi’s playing days in Iran almost scarred his legacy. In August 2010, the Iranian club Steel Azin dismissed Karimi, its best player, amid allegations that he was not fasting during Ramadan. In Iran, this wasn’t just a social faux pas or a religious shortcoming as a Muslim; it was against national law. In other words, this was bigger than Tom Brady tampering with footballs or Donald Sterling revealing his racism. Karimi denied the allegations, and the whole thing was resolved a few days later when he paid a fine and the club reinstated him. Five years later, the fasting incident apparently did little to no damage to Karimi’s reputation. In a recent poll taken by an Iranian TV station, Karimi was voted the country’s most popular soccer player of the last 20 years by a wide margin. Even in retirement, the player nicknamed “The Magician” and “The Asian Maradona” (a comparison to Argentine superstar Diego Maradona) shines as the brightest light in Iranian soccer.